Welcome to the Patkowski lab! Left to right: Jonathan, Narendra, Daniel, Monika, Sicheng, Reza, Konrad. We are a theoretical and computational chemistry group. We use the methods of quantum mechanics and powerful computers to study the properties of molecules and clusters. In particular, we are interested in weak intermolecular interactions and the methods that can be used to calculate the interaction energy accurately and efficiently. Please see the Research tab for a more detailed description. If you have any questions, do not hesitate to contact Dr. Konrad Patkowski directly. Graduate Student in Dr. Sherrill's group, Georgia Institute of Technology, Atlanta, GA. Openings are available for both graduate and undergraduate researchers. Prospective students are encouraged to contact Dr. Patkowski. Intermolecular interactions are everywhere. A network of intermolecular hydrogen bonds determines the properties of liquid water and aqueous solutions. Hydrogen bonds as well as other effects (like stacking interactions of aromatic side chains) govern the structure of proteins and the catalytic abilities of enzymes. Even the least reactive species like rare gas atoms exhibit weak mutual attraction due to a phenomenon called dispersion. In fact, this attraction is the very reason why rare gases form liquids and solids at low temperatures. In a computational study of the interaction between two atoms or molecules, the key quantity is the potential energy surface (PES). This surface represents the electronic interaction energy of the dimer as a function of the intermonomer distance and of the relative orientation of monomers. Once the PES is known, we can calculate various quantities (spectra, virial coefficients, liquid and crystal parameters) that can be compared to experimental predictions. The interaction energy at a given geometry is usually calculated in the so-called supermolecular manner: you pick your favorite quantum-chemistry electronic-structure theory, compute the energy of the dimer AB, and subtract the energies of monomers A and B. This subtraction can be tricky - the result is orders of magnitude smaller than the energies you subtract (it is like weighing a person by placing her on a large, fully loaded ship, and weighing the ship with and without her). Moreover, the result of the subtraction (a single number) does not really tell much about the underlying physics of the interaction. A useful alternative to the supermolecular approach is provided by symmetry-adapted perturbation theory (SAPT) where the interaction energy is calculated directly (no subtraction) as a sum of low-order terms in a perturbation series. Each of these terms has a clear physical interpretation and corresponds to an electrostatic, induction, dispersion, or exchange effect. The supermolecular and SAPT methods nicely complement each other and it is often useful to employ both approaches (as well as several different electronic-structure methods) to construct and interpret accurate PESs. Obviously, the larger the dimer, the more approximate methods have to be used. More accurate approaches tend to scale steeply with the system size and require a lot of CPU time and memory even on powerful supercomputers. SAPT: What's in the name? SAPT is a perturbation theory. Perturbation theory is a way of obtaining an approximate solution to a hard problem if we know an exact solution to a problem that is similar but easier. In the case of SAPT, the easier problem is the electronic Schrödinger equation for two molecules that do not interact, and the hard problem is the same equation with the intermolecular interactions (the Coulomb attractions and repulsions between the nuclei and electrons of molecule A with those of molecule B) switched on. If the interactions are relatively weak, we can expect that the energies of the system will not change a lot between the two cases, and that the change in energy can be expanded in a power series (with terms that are linear, quadratic, cubic, ... with respect to the strength of the interaction). SAPT involves symmetry adaptation. Quantum mechanics requires the wave function of a many-electron system to be antisymmetric with respect to interchanges between electrons. That is, our big and complicated wave function of two molecules (that depends on the positions of all electrons) must change its sign when the position of electron k is substituted for the position of electron l and vice versa. The antisymmetry of the wave function is the reason for the Pauli principle - no more than two electrons can occupy each orbital. In SAPT, the solution to the easier problem (no interaction) is less antisymmetric than the solutions to the hard problem (with interaction) has to be, so the wave function has to be adapted to this additional (anti)symmetry. There are different ways of performing symmetry adaptation that lead to different variants of SAPT. SAPT(0) - monomers are described by the Hartree-Fock theory. No intramonomer correlation is included at all. This approach might give a useful general picture of the interaction but it is not accurate enough for quantitative studies. many-body SAPT - the intramonomer correlation is taken into account via a second perturbation theory (the energy is expanded in a two-dimensional power series) like in the popular Moller-Plesset perturbation theory (MP2, MP4, ...). This approach can lead to very accurate interaction energies but the calculations are quite computationally demanding. At the standard level of theory, the many-body SAPT computation scales like the seventh power of the system size, just like for the CCSD(T) method. SAPT(CC) - a newly developed method where the SAPT corrections are expressed through monomer properties calculated from the coupled-cluster theory (CCSD). This approach is even more accurate, and even more computationally demanding, than many-body SAPT. SAPT(DFT) (also known as DFT-SAPT) - the intramonomer correlation effects are accounted for by density functional theory (DFT). This method can match the accuracy of many-body SAPT at a fraction of its computational cost. 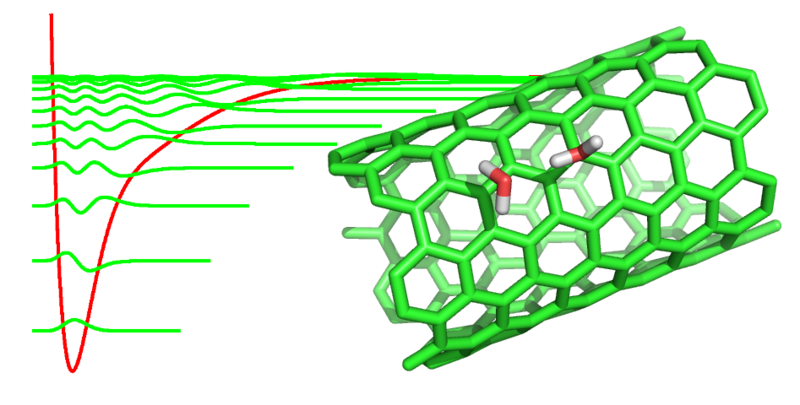 SAPT(DFT) has been applied to systems as large as the coronene dimer (C24H12)2 and a hydrogen molecule inside the C60 fullerene. We are working on the extension of the SAPT(0) and SAPT(DFT) formalism to the general open-shell case, including dimers of low-spin monomers which cannot be described by any single-determinantal wave function (we say that these monomers have a truly multireference character). So far, the SAPT and SAPT(DFT) methodology has been established and implemented for closed-shell systems and extended in the case of high-spin open-shell monomers (those that can be described by a single Slater determinant). The derivation of a multireference SAPT theory, with monomers described by the complete-active-space self-consistent field (CASSCF) method, employs and extends the ideas that have led to the development of CASSCF-based many-body perturbation theory (CASPT2, CASPT3), CASSCF linear response functions, and exchange corrections within standard SAPT utilizing a so-called single exchange approximation. The development of open-shell SAPT and SAPT(DFT) is motivated by a need for reliable and physically interpretable interaction energies for open-shell systems like transition-metal atoms and complexes, as well as radicals involved in various chemical and biochemical processes. Physisorption is the binding of molecules to surfaces that occurs as a result of weak intermolecular interactions, unlike the chemisorption process where the adsorbate is attached to the surface by a covalent bond. The weak binding between the surface and the physisorbed molecule is typically due to dispersion interactions. Dispersion is a purely quantum-mechanical phenomenon that involves a correlation between fluctuating dipole moments induced on both monomers. It is responsible, among others, for the attractive interactions between nonpolar systems ranging from rare gas atoms to aromatic rings. A standard method of choice for studying medium-sized systems, the density functional theory, fails miserably for physisorption because of its inherent inability to account for dispersion interactions in a consistent way. Numerous studies have been directed at correcting this deficiency of DFT and significant progress was achieved in this field in recent years. This progress has driven a new wave of physisorption studies that employ novel dispersion-corrected variants of DFT - an emerging and promising direction of research. With extensive previous experience in both wave function theory and dispersion-corrected DFT, our group is well qualified for pushing the description of physisorption to a new level of accuracy and understanding. In our opinion, the most complete picture can be obtained by a combination of accurate wave function calculations for small model systems and dispersion-corrected density functional theory for a larger fragment of the surface. Among the available novel DFT methods, the "dispersionless density functional" approach, co-developed by our group leader, is the method of first choice due to the unambiguous distinction between dispersion and the rest of the interaction energy. A classic example of a system bound by physisorption are molecules (hydrogen, water, alkanes, ...) attached to a graphite surface or to a graphene sheet. With the curvature of the surface taken into account, the adsorption on inner and outer walls of carbon nanotubes can also be described. Molecules adsorbed on quartz and metallic oxide surfaces are another class of technologically important systems to be studied. When the standard supermolecular CCSD(T) theory with large basis sets and complete basis set extrapolation usually gives interaction energies accurate to about 1-2%, is there any point to go beyond this accuracy? Quite often, there is. First of all, there are systems for which CCSD(T) is not nearly as accurate. For example, for the beryllium dimer the CCSD(T) interaction energy is in error by more than 20% - the reason is the near-degenerate character of the beryllium atom. Even when CCSD(T) is as accurate as usual, some applications of intermolecular potentials demand an even higher accuracy, and some quantities, most notably those associated with scattering processes, are extremely sensitive to the quality of the potential. For two interacting helium atoms, the needs of the metrology community (a task of establishing new, improved temperature and pressure standards) have called for, and received, an interaction potential that is accurate to 100 ppm. Last but not least, experimental measurements provide, together with any measured value, an estimate of its uncertainty. Can we theorists do the same? Obtaining an estimated uncertainty of an ab initio result is not an easy task and has to include contributions due to the inexactness of the theory employed (have we managed to do FCI? CCSDTQ? CCSDT? ), the incompleteness of the basis set (how well do extrapolated and nonextrapolated results converge? ), and the effects that have been neglected or approximated (relativistic effects? core-core and core-valence correlation?) Estimating the theoretical uncertainties calls for a well-designed set of high-level ab initio calculations. Pimienta, I. S. O.; Patkowski, K. "Heats of Formation and Thermal Stability of Substituted 1,1'-Azobis(tetrazole) Compounds with an Extended Nitrogen Chain" Int. J. Quantum Chem. (accepted). Smith, D. G. A.; Burns, L. A.; Sirianni, D. A.; Nascimento, D. R.; Kumar, A.; James, A. M.; Schriber, J. B.; Zhang, T.; Zhang, B.; Abbott, A. S.; Berquist, E. J.; Lechner, M. H.; dos Anjos Cunha, L.; Heide, A. G.; Waldrop, J. M.; Takeshita, T. Y.; Alenaizan, A.; Neuhauser, D.; King, R. A.; Simmonett, A. C.; Turney, J. M.; Schaefer, H. F.; Evangelista, F. A.; DePrince III, A. E.; Crawford, T. D.; Patkowski, K.; Sherrill, C. D. "Psi4NumPy: An Interactive Quantum Chemistry Programming Environment for Reference Implementations and Rapid Development", J. Chem. Theory Comput. 2018, 14, 3504. Dutta, N. N.; Patkowski, K. "Improving 'silver-standard' benchmark interaction energies with bond functions", J. Chem. Theory Comput. 2018, 14, 3053. Patkowski, K.; Żuchowski, P. S.; Smith, D. G. A. "First-order symmetry-adapted perturbation theory for multiplet splittings", J. Chem. Phys. 2018, 148, 164110. Song, B.; Waldrop, J. M.; Wang, X. P.; Patkowski, K. "Accurate virial coefficients of gaseous krypton from state-of-the-art ab initio potential and polarizability of the krypton dimer", J. Chem. Phys. 2018, 148, 024306. Thibault, F.; Patkowski, K.; Żuchowski, P. S.; Jóźwiak, H.; Ciuryło, R.; Wcisło, P. "Rovibrational line-shape parameters for H2 in He and new H2-He potential energy surface", J. Quant. Spectrosc. Radiat. Transf. 2017, 202, 308. Patkowski, K. "Benchmark Databases of Intermolecular Interaction Energies: Design, Construction, and Significance", in Annu. Rep. Comput. Chem. (Dixon, D. A., Ed.) Vol. 13, Amsterdam: Elsevier, 2017, pp. 3-91. Parrish, R. M.; Burns, L. A.; Smith, D. G. A.; Simmonett, A. C.; DePrince III, A. E.; Hohenstein, E. G.; Bozkaya, U.; Sokolov, A. Yu. ; Di Remigio, R.; Richard, R. M.; Gonthier, J. F.; James, A. M.; McAlexander, H. R.; Kumar, A.; Saitow, M.; Wang, X.; Pritchard, B. P.; Verma, P.; Schaefer III, H. F.; Patkowski, K.; King, R. A.; Valeev, E. F.; Evangelista, F. A.; Turney, J. M.; Crawford, T. D.; Sherrill, C. D. "Psi4 1.1: An Open-Source Electronic Structure Program Emphasizing Automation, Advanced Libraries, and Interoperability, J. Chem. Theory Comput. 2017, 13, 3185. Smith, D. G. A.; Burns, L. A.; Patkowski, K.; Sherrill, C. D. "Revised Damping Parameters for the D3 Dispersion Correction to Density Functional Theory" J. Phys. Chem. Lett. 2016, 7, 2197. Li, S.; Smith, D. G. A.; Patkowski, K. "An Accurate Benchmark Description of the Interactions between Carbon Dioxide and Polyheterocyclic Aromatic Compounds Containing Nitrogen" Phys. Chem. Chem. Phys. 2015, 17, 16560. Waldrop, J. M.; Song, B.; Patkowski, K.; Wang, X. P. "Accurate ab initio potential for the krypton dimer and transport properties of the low-density krypton gas" J. Chem. Phys. 2015, 142, 204307. Smith, D.G.A. ; Patkowski, K. Benchmarking the CO2 Adsorption Energy on Carbon Nanotubes" J. Phys. Chem. C 2015, 119, 4934. Garberoglio, G.; Patkowski, K.; Harvey, A. H. "Fully Quantum Cross Second Virial Coefficients for the Three-Dimensional He-H2 Pair" Int. J. Thermophys. 2014, 35, 1435. Smith, D.G.A. ; Jankowski, P.; Slawik, M.; Witek, H.A. ; Patkowski, K. "Basis set convergence of the post-CCSD(T) contribution to noncovalent interaction energies" J. Chem. Theory Comput. 2014, 10, 3140. Smith, D.G.A. ; Patkowski, K.; Trinh, D.; Balakrishnan, N.; Lee, T.-G.; Forrey, R. C.; Yang, B. H.; Stancil, P. C. "Highly correlated electronic structure calculations of the He-C3 van der Waals complex and collision induced rotational transitions of C3" J. Phys. Chem. A 2014, 118, 6351. Smith, D.G.A. ; Patkowski, K. "Toward an accurate description of methane physisorption on carbon nanotubes" J. Phys. Chem. C 2014, 118, 544. Bakr, B.W. ; Smith, D.G.A. ; Patkowski, K. "Highly accurate potential energy surface for the He-H2 dimer" J. Chem. Phys., 2013, 139, 144305. Patkowski, K. "Basis set converged weak interaction energies from conventional and explicitly correlated coupled-cluster approach" J. Chem. Phys., 2013, 138, 154101. Smith, D.G.A. ; Patkowski, K. "Interactions between methane and polycyclic aromatic hydrocarbons: a high accuracy benchmark study" J. Chem. Theory Comput., 2013, 9, 370. Patkowski, K. "On the accuracy of explicitly correlated coupled-cluster interaction energies - have orbital results been beaten yet?" J. Chem. Phys., 2012, 137, 034103. Patkowski, K.; Szalewicz, K. "Argon pair potential at basis set and excitation limits" J. Chem. Phys., 2010, 133, 094304. Patkowski, K.; Szalewicz, K.; Jeziorski, B. "Orbital relaxation and the third-order induction energy in symmetry-adapted perturbation theory" Theor. Chem. Acc., 2010, 127, 211. Podeszwa, R.; Patkowski, K.; Szalewicz, K. "Improved interaction energy benchmarks for dimers of biological relevance" Phys. Chem. Chem. Phys., 2010, 12, 5974. Podeszwa, R.; Pernal, K.; Patkowski, K.; Szalewicz, K. "Extension of the Hartree-Fock plus dispersion method by first-order correlation effects" J. Phys. Chem. Lett., 2010, 1, 550. Pernal, K.; Podeszwa, R.; Patkowski, K.; Szalewicz, K. "Dispersionless density functional theory" Phys. Rev. Lett., 2009, 103, 263201. Cencek, W.; Patkowski, K.; Szalewicz, K. "Full configuration-interaction calculation of three-body nonadditive contribution to helium interaction potential," J. Chem. Phys., 2009, 131, 064105. Patkowski, K.; Cencek, W.; Jankowski, P.; Szalewicz, K.; Mehl, J.B.; Garberoglio, G.; Harvey, A.H. "Potential energy surface for interactions between two hydrogen molecules" J. Chem. Phys., 2008, 129, 094304. Jeziorska, M.; Cencek, W.; Patkowski, K.; Jeziorski, B.; Szalewicz, K. "Complete basis set extrapolations of dispersion, exchange, and coupled-clusters contributions to the interaction energy: a helium dimer study," Int. J. Quantum Chem., 2008, 108, 2053. Patkowski, K.; Podeszwa, R.; Szalewicz, K. "Interactions in diatomic dimers involving closed-shell metals" J. Phys. Chem. A, 2007, 111, 12822. Patkowski, K.; Szalewicz, K. "Frozen core and effective core potentials in symmetry-adapted perturbation theory" J. Chem. Phys., 2007, 127, 164103. Jeziorska, M.; Cencek, W.; Patkowski, K.; Jeziorski, B.; Szalewicz, K. "Pair potential for helium from symmetry-adapted perturbation theory calculations and from supermolecular data" J. Chem. Phys., 2007, 127, 124303. Patkowski, K.; Cencek, W.; Jeziorska, M.; Jeziorski, B.; Szalewicz, K. "Accurate pair interaction energies for helium from supermolecular Gaussian geminal calculations" J. Phys. Chem. A, 2007, 111, 7611. Patkowski, K.; Szalewicz, K.; Jeziorski, B. "Third-order interactions in symmetry-adapted perturbation theory" J. Chem. Phys., 2006, 125, 154107. Bukowski, R.; Cencek, W.; Patkowski, K.; Jankowski, P.; Jeziorska, M.; Kolaski, M.; Szalewicz, K. "Portable parallel implementation of symmetry-adapted perturbation theory code" Mol. Phys., 2006, 104, 2241. Szalewicz, K.; Patkowski, K.; Jeziorski, B. "Intermolecular interactions via perturbation theory: from diatoms to biomolecules" Struct. Bonding (Berlin), 2005, 116, 43. Patkowski, K.; Murdachaew, G.; Fou, C.-M.; Szalewicz, K. "Accurate ab initio potential for argon dimer including highly repulsive region," Mol. Phys., 2005, 103, 2031. Patkowski, K.; Jeziorski, B.; Szalewicz, K. "Unified treatment of chemical and van der Waals forces via symmetry-adapted perturbation expansion" J. Chem. Phys., 2004, 120, 6849. Przybytek, M.; Patkowski, K.; Jeziorski, B. "Convergence behavior of symmetry-adapted perturbation expansions for excited states. A model study of interactions involving a triplet helium atom" Collect. Czech. Chem. Commun., 2004, 69, 141. Brudermann, J.; Steinbach, C.; Buck, U.; Patkowski, K.; Moszynski, R. "Elastic and rotationally inelastic differential cross sections for He + H2O collisions" J. Chem. Phys., 2002, 117, 11166. Patkowski, K.; Jeziorski, B.; Korona, T.; Szalewicz, K. "Symmetry-forcing procedure and convergence behavior of perturbation expansions for molecular interaction energies" J. Chem. Phys., 2002, 117, 5124. Patkowski, K.; Korona, T.; Moszynski, R.; Jeziorski, B.; Szalewicz, K. "Ab initio potential energy surface and second virial coefficient for He-H2O complex" J. Mol. Struct. (Theochem), 2002, 591, 231. Patkowski, K.; Korona, T.; Jeziorski, B. "Convergence behavior of the symmetry-adapted perturbation theory for states submerged in Pauli forbidden continuum" J. Chem. Phys., 2001, 115, 1137. Patkowski, K.; Jeziorski, B.; Szalewicz, K. "Symmetry-adapted perturbation theory with regularized Coulomb potential" J. Mol. Struct. (Theochem), 2001, 547, 293. All the class materials (lecture notes, homework, exam solutions, etc.) are available through the course Canvas page. Access is restricted to students enrolled in the course. November 2016: Monika represented the group at the Annual Meeting of the National Organization for the Professional Advancement of Black Chemists and Chemical Engineers (NOBCChE) in Raleigh, North Carolina. She presented a poster on high-order coupled-cluster contributions to interaction energies. October 2016: Konrad gave a talk at the 2016 Southeastern Regional Meeting of the American Chemical Society in Columbia, South Carolina, at the invitation of Dr. Sophya Garashchuk and Dr. Vitaly Rassolov. September 2016: Our friend and collaborator, Dr. Piotr Żuchowski from the Nicolaus Copernicus University, Toruń, Poland, visited our group in Auburn for a week. August 2016: Konrad officially became a tenured Associate Professor at the Department of Chemistry and Biochemistry. In addition, he started a courtesy appointment at the Department of Physics. July 2016: Sicheng successfully defended his Master's thesis. Great job, Sicheng! July 2016: Konrad went to two meetings this month. 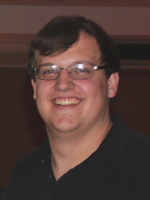 He presented a poster at the 9th Congress of the International Society of Theoretical Chemical Physics (ISTCP) in Grand Forks, North Dakota, and gave a lecture at the 16th Southern School on Computational Chemistry and Materials Science (SSCC&MS) in Jackson, Mississippi. May 2016: Another paper from Daniel's PhD research got accepted by the Journal of Physical Chemistry Letters. The paper, written in collaboration with Dr. Lori Burns and Dr. David Sherrill at Georgia Tech, uses a massive database of accurate noncovalent interaction energies to improve the damping functions for commonly used DFT-D3 approaches. May 2016: The group was well represented at this year's SETCA meeting at the Florida State University in Tallahassee. Jonathan came home with an award, the 3rd place in the Best Graduate Student Poster competition - awesome job, Jonathan! Monika and Reza also presented posters and Konrad gave a talk. May 2016: Monika and Jonathan both passed their oral examinations and became PhD candidates. Congratulations, Monika and Jonathan! February 2016: Konrad gave back-to-back research talks at the Chemistry departments at the University of Mississippi and Mississippi State University. 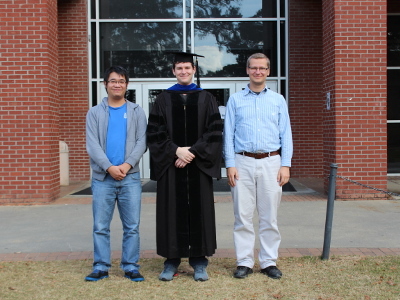 December 2015: Dr. Daniel Smith (pictured here with Sicheng and Konrad) received his PhD diploma. Next stop: a postdoctoral position in Dr. David Sherrill's group at Georgia Tech! November 2015: Daniel passed his PhD exam with flying colors! Way to go, Dr. Smith! November 2015: Konrad gave a talk at the "Recent Advances in Chemical Physics" symposium at the joint Southeastern/Southwestern Regional Meeting of the American Chemical Society in Memphis. 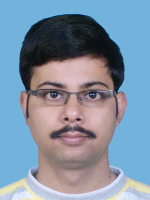 October 2015: Dr. Narendra Nath Dutta joined the group as a postdoctoral researcher. Welcome to Auburn, Narendra! 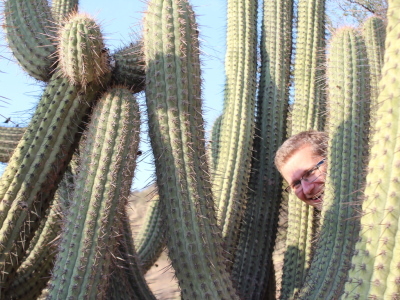 October 2015: Konrad visited as many as three other universities this month. He gave talks at Columbus State University (invited by Dr. Anil Banerjee), Michigan State University (invited by Dr. Piotr Piecuch), and Oakland University (invited by Dr. Maria Bryant (Szczesniak)). October 2015: Our group hosted the departmental colloquium speaker, Dr. Ken Jordan from the University of Pittsburgh. September 2015: Konrad was the colloquium speaker at the Auburn University Department of Chemical Engineering, invited by Dr. Virginia Davis. July 2015: The group did a lot of traveling this month. Monika and Sicheng attended the (SICM)2 Parallel Computing Workshop at Virginia Tech. Konrad and Daniel went to the workshop "Intermolecular Interactions: New Challenges for ab initio Theory" in Telluride, Colorado. They both presented talks there. 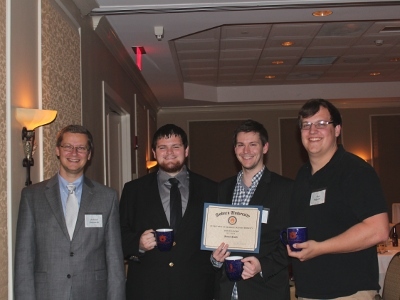 May 2015: Four graduate students from our group went to this year's SETCA meeting at the University of Central Florida in Orlando. Daniel gave a contributed talk, and Monika, Jonathan, and Sicheng presented posters. May 2015: Konrad spent a month at the Faculty of Physics, Astronomy and Informatics, Nicolaus Copernicus University, Toruń, Poland, on an European Union-funded visiting professor fellowship. He was invited by Dr. Piotr Żuchowski. Several new, exciting collaborative projects were established, and this stay was also very helpful for our theory development project! During this time, Konrad gave two talks, one in Toruń and one at his alma mater, the University of Warsaw. May 2015: This was a very good month for the group's publications - Jonathan and Sicheng both got his first papers accepted! Jonathan's paper on the krypton dimer potentials and properties of krypton gas (in collaboration with Dr. Bo Song and Dr. Xiaopo Wang from Xi'an Jiaotong University) will appear in the Journal of Chemical Physics, and Sicheng's paper (Daniel pitched in too!) on N-doped graphene adsorption will soon be published in Physical Chemistry Chemical Physics. Kudos to Sicheng and Jonathan! April 2015: Daniel received the prestigious Chemical Computing Group Excellence Award for Graduate Students from the American Chemical Society Division of Computers in Chemistry. Daniel will present the award poster during the Fall 2015 ACS National Meeting in Boston. Awesome job, Daniel! April 2015: Our proposal "Adsorption on carbon nanotubes-understanding the intermolecular forces at all length scales" was funded by the Auburn University Intramural Grants Program. 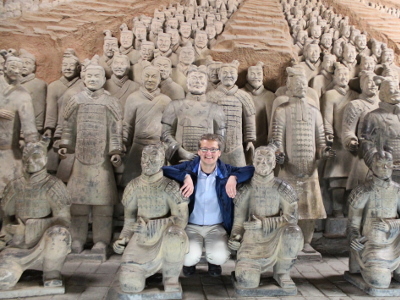 April 2015: Konrad spent ten days and gave two talks at the Key Laboratory of Thermo-Fluid Science and Engineering at Xi’an Jiaotong University, Xi’an, China, invited by our collaborator, Dr. Bo Song. This was a productive and fun visit! March 2015: Konrad gave a talk at the Emory University Department of Chemistry, invited by Prof. Francesco Evangelista. February 2015: Daniel's paper on the carbon dioxide adsorption on carbon nanotubes was accepted by the Journal of Physical Chemistry C. Great job, Daniel! January 2015: Our group hosted the departmental colloquium speaker, Dr. Gary Douberly from the University of Georgia. 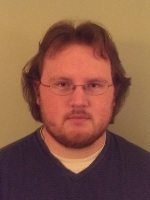 January 2015: Konrad received The OpenEye Outstanding Junior Faculty Award in Computational Chemistry from the Computers in Chemistry Division of the American Chemical Society. Konrad will present the award poster (featuring Daniel's work) during the Spring 2015 ACS National Meeting in Denver. 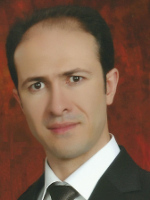 January 2015: Reza Hemmati joined the group as a graduate student. Welcome to the group, Reza! December 2014: Check out the latest issue of the COSAM Journey magazine, with a story (by Candis Birchfield) about our group's research on page 37. 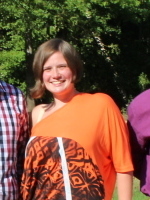 November 2014: Monika Kodrycka joined the group as a graduate student. Welcome on board, Monika! October 2014: Konrad went to Santiago, Chile to participate in the big triannual event, the Congress of the World Association of Theoretical and Computational Chemists (WATOC). He delivered a contributed talk on the high-order coupled-cluster interaction energy corrections and caught up with many old friends. October 2014: Our group hosted the departmental colloquium speaker, Dr. Ian Pimienta from Troy University. September 2014: Konrad gave an invited talk at the 2014 Central European Symposium on Theoretical Chemistry in Nagybörzsöny, Hungary. Konrad participated in several CESTC symposia as a graduate student and was very glad to be back after all these years! September 2014: Konrad gave the Physical Chemistry seminar at Georgia Tech, invited by Prof. David Sherrill. August 2014: A new paper on accurate low-temperature second virial coefficients for the He-H2 mixture, coauthored by Dr. Giovanni Garberoglio (University of Trento, Italy), Dr. Allan Harvey (National Institute of Standards and Technology), and Konrad, was accepted by the International Journal of Thermophysics. This paper builds on the accurate potential developed by Brandon back in 2013. July 2014: Daniel did quite a bit of summer traveling. He attended the (SICM)2 Parallel Computing Workshop at Stony Brook University and presented a poster at the American Conference on Theoretical Chemistry (ACTC) in Telluride, Colorado. Daniel did so well in the computing workshop that he will be teaching at such events from time to time (through The Software Carpentry Foundation). June 2014: Another one of Daniel's papers, the one on CCSDT and CCSDT(Q) contributions to van der Waals interaction energies, was accepted by the Journal of Chemical Theory and Computation. This paper was a collaboration led by our group, involving researchers from Nicolaus Copernicus University (Torun, Poland) and National Chiao Tung University (Hsinchu, Taiwan). That's three first-author papers for Daniel in 2014! May 2014: Our group was well represented at the 2014 Annual Meeting of the Southeastern Theoretical Chemistry Association (SETCA) in Atlanta. Konrad gave a talk, Daniel, Sicheng, and Habib presented posters. Kudos to the organizer, Dr. Francesco Evangelista from Emory University, for putting together a great conference! 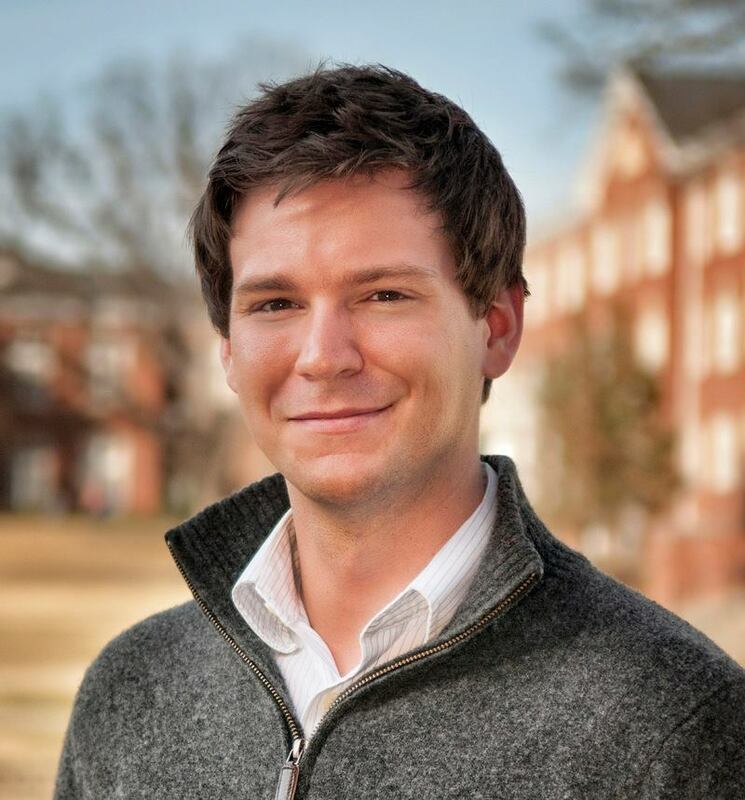 May 2014: Jonathan Waldrop joined the group as a graduate student. Welcome to the group, Jonathan! March 2014: Konrad received an NSF CAREER award to develop a multireference variant of symmetry-adapted perturbation theory. Here is the abstract of the award. This is a major breakthrough for the group and we are looking forward to advancing this exciting project! 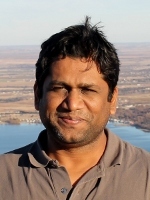 March 2014: Dr. Habib Ur Rehman joined the group as a postdoctoral researcher. Welcome on board, Habib! February 2014: Our computer cluster received another upgrade. We are now at 26 nodes and 544 cores. January 2014: Daniel's paper on the He-C3 interaction potential was accepted by the Journal of Physical Chemistry A. This paper is a result of our collaboration with experts on atomic and molecular scattering from The University of Georgia, University of Nevada at Las Vegas, and Pennsylvania State University Berks Campus. We are looking forward to working together on further exciting projects! January 2014: Konrad presented the colloquium at the Department of Chemistry, The University of Alabama at Birmingham. 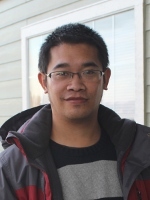 January 2014: Sicheng Li has officially joined the group as a graduate student. Welcome to the group, Sicheng! December 2013: Daniel's paper "Toward an accurate description of methane physisorption on carbon nanotubes" was accepted by the Journal of Physical Chemistry C. Way to go, Daniel! November 2013: Daniel passed his oral examination (with flying colors) and became a PhD candidate. Congratulations, Daniel! November 2013: Daniel presented a poster on his methane-nanotube research at The Southeast Regional Meeting of the American Chemical Society (SERMACS) in Atlanta. Our group alumnus, Brandon, was also there with a poster on his He-H2 work. November 2013: At the invitation of our collaborator, Dr. Phillip Stancil, Konrad and Daniel visited the Department of Physics and Astronomy at the University of Georgia. Konrad gave a seminar "Interactions of atoms, molecules, and surfaces - pushing the limits of accuracy" at the UGA Center for Simulational Physics. October 2013: Konrad was the colloquium speaker at the Auburn University Physics Department, invited by Dr. Jianjun Dong. October 2013: Konrad visited the Swiss Federal Institute of Technology in Lausanne, invited by Dr. Clemence Corminboeuf, to attend the (successful) PhD examination of Mr. Jerome Gonthier as an external referee. 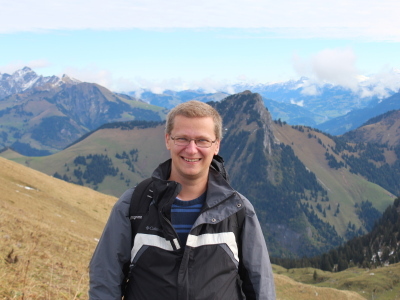 He also gave a talk for Dr. Corminboeuf's group and found some time to take a short hike in the Swiss Alps. September 2013: Brandon's paper about a new highly accurate He-H2 interaction potential was accepted by The Journal of Chemical Physics. Congratulations on your first publication, Brandon! June 2013: 26 bright high-school students from Alabama and Georgia came to campus for the Summer Science Institute, a week-long event full of hands-on science. Our group contributed a computational chemistry module in which the students got to perform real quantum chemistry calculations using the WebMO framework. Check out the featured story on the Auburn website. May 2013: The 2013 Annual Meeting of the Southeastern Theoretical Chemistry Association (SETCA) came to Auburn, co-organized by Dr. Vince Ortiz, Dr. Mike McKee, Dr. Orlando Acevedo, and Konrad. The meeting drew 80 participants from the entire Southeast (from Texas to North Carolina). Daniel and Brandon presented posters. The meeting was a big success and our group is already looking forward to participating in SETCA2014 in Atlanta! May 2013: Alex and Brandon have graduated from Auburn and are on to the next exciting stages of their careers. Brandon is going to pursue a PhD in Chemistry at Georgia Tech. Alex goes back to his hometown Memphis to attend dental school. Congratulations, Alex and Brandon, and lots of luck on your future career paths! April 2013: Daniel was awarded the Dow fellowship by the Department of Chemistry and Biochemistry. He received his award at the annual departmental banquet. Congratulations, Daniel! Our graduating seniors, Alex and Brandon, were also honored at the banquet. 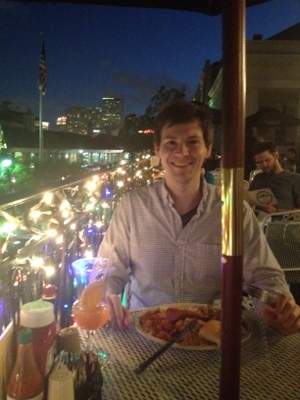 April 2013: Konrad and Daniel went to New Orleans for the Spring 2013 ACS National Meeting. Daniel presented a poster "Towards an Accurate Description of Methane Physisorption on Carbon Nanotubes", and Konrad gave a talk about his recent work on ultra-accurate interaction energies from CCSD(T) and CCSD(T)-F12. March 2013: Konrad's new paper on CCSD(T)-F12 interaction energies was accepted by The Journal of Chemical Physics. March 2013: Brandon and Alex gave presentations in the Analytical and Physical Division seminar series. Both presentations were well received and graded A. Great job, Brandon and Alex! 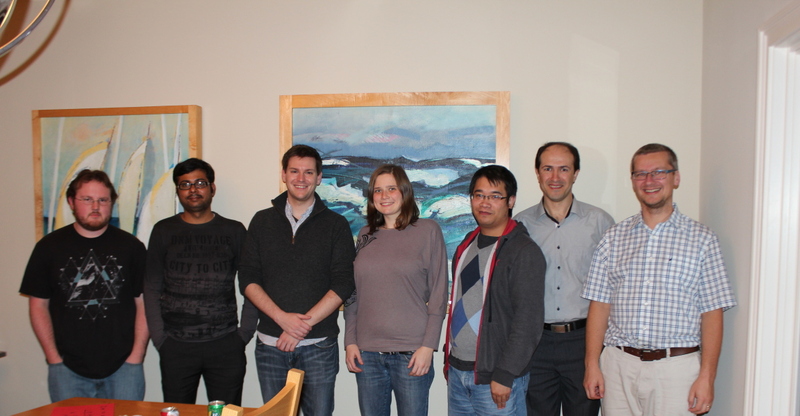 February 2013: Our group hosted the departmental colloquium speaker, Dr. Edward Valeev from Virginia Tech. December 2012: Konrad gave a talk at the Department of Applied Chemistry, National Chiao Tung University, Hsinchu, Taiwan. 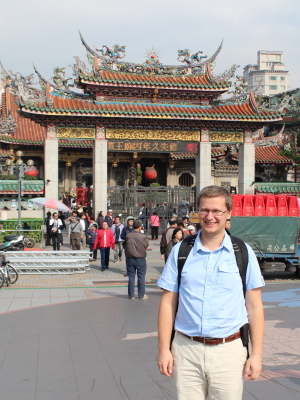 He was invited by our friend and collaborator, Dr. Henryk Witek, and had an amazing time in Taiwan. November 2012: Daniel's first paper "Interactions between Methane and Polycyclic Aromatic Hydrocarbons: A High Accuracy Benchmark Study" was accepted by the Journal of Chemical Theory and Computation. Great work, Daniel! 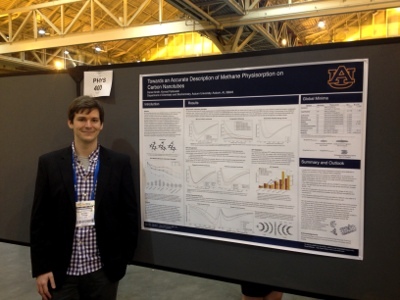 November 2012: Konrad went to Jackson, MS to participate in the 21th Conference on Current Trends in Computational Chemistry. He presented a poster "Weak interaction energies from approximate CCSD(T)-F12: better than large-basis CCSD(T)?" July 2012: Daniel presented his poster on methane-polycyclic aromatic hydrocarbon interactions at the Gordon Conference on Atomic & Molecular Interactions. The conference was held on the Stonehill College campus in Easton, MA. June 2012: Konrad's paper on the accuracy of the CCSD(T)-F12 approaches for weak interaction energies was accepted by The Journal of Chemical Physics. We have the first group paper! June 2012: Konrad went to Boulder, CO to participate in the XIVth International Congress of Quantum Chemistry. He presented a poster about Daniel's work on methane interacting with polycyclic aromatic hydrocarbons. May 2012: Brandon Bakr and Alexander Pilgreen have joined the group as undergraduate researchers. Welcome to the group, Brandon and Alex! May 2012: Our group was well represented at the 2012 Annual Meeting of the Southeastern Theoretical Chemistry Association (SETCA) in Athens, GA. Konrad gave a talk "On the accuracy of explicitly correlated CCSD(T) interaction energies - have orbital results been beaten yet?" and Daniel presented a poster "Interactions Between Methane and Polycyclic Aromatic Hydrocarbons: A High Accuracy Benchmark Study". Our group will help organize the 2013 SETCA Annual Meeting in Auburn. April 2012: Ten shiny new nodes for our computer cluster have arrived. We have 352 cores now! 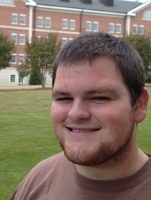 March 2012: Daniel gave a talk "Interactions Between Methane and Polycyclic Aromatic Hydrocarbons: A High Accuracy Benchmark Study" at the 2012 Research and Creative Activity Symposium at Alabama State University. March 2012: Konrad gave a two-part talk "Graduate study in Chemistry and Biochemistry at Auburn" and "Van der Waals Interactions as Seen by Quantum Chemistry" at the University of North Alabama. February 2012: Our group hosted the departmental colloquium speaker, Dr. John M. Herbert from the Ohio State University. January 2012: Daniel Smith has officially joined the group. Welcome to the group, Daniel! October 2011: The entire group attended the 20th Conference on Current Trends in Computational Chemistry (CCTCC) in Jackson, Mississippi. Konrad and Daniel presented posters "Induction and exchange-induction energy with a regularized Coulomb potential" and "The Competition Between Intermolecular and Intramolecular Hydrogen Bonding Networks in the Stabilization of Van Der Waals Complexes of a Series of Amino Alcohols with Water", respectively. October 2011: Our grant proposal "Accurate Ab Initio Studies of Hydrocarbon Physisorption on Carbon Nanotubes", submitted to the American Chemical Society Petroleum Research Fund - Doctoral New Investigator program (ACS PRF DNI), got funded. We received $100,000 for the period 1/1/2012 through 8/31/2014. It will be a big boost for our research! June 2011: Our very own computer cluster just arrived. Thanks to Auburn University for the startup funding! 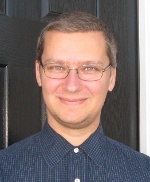 May 2011: Konrad gave a talk "Limits of accuracy in interatomic and intermolecular potentials" at the 2011 Southeast Theoretical Chemistry Association (SETCA) Annual Meeting at Mississippi State. February 2011: This page is created. Group news will be posted here. Quantum chemistry is a science that applies the methods of quantum mechanics and applies them to systems of interest to chemistry - molecules, clusters, and chemical reactions. By solving the central formula of quantum mechanics - the Schrodinger equation - we obtain molecular wave functions and energy levels, which we then can use to calculate geometries, spectroscopical properties, and other quantities that can be compared with experiment. OK, so we have an equation to solve. Does that mean that quantum chemistry is a pen-and-paper science? Not at all. The most complicated system for which the Schrödinger equation can be solved exactly is the hydrogen atom (and even that only if we do not take into account the effects of quantum electrodynamics). Anything that has more than one electron and/or more than one nucleus has to be treated approximately, and there is no better way to do these approximate calculations than using computers. The computers are so fast and powerful these days. Can't all the quantum chemistry problems be solved right away? Not quite. There are many approximate methods in quantum chemistry. Some of them are more approximate but very fast, some are more accurate but much more computationally expensive. To compare the computational cost of different algorithms, people like to talk about scaling of a method with a system size N. For example, if a method scales quadratically (N2) with system size, if the molecule is made twice as large, it takes the computer 4=22 more times to perform the calculation. Some accurate methods of quantum chemistry (like the popular and reliable CCSD(T) approach) scale like the seventh or even higher power of the system size. That means if we want to be able to apply the method to a molecule that is twice as large, we need a computer that is 27=128 times more powerful! There are several popular quantum-chemistry codes on the market, including GAUSSIAN, MOLPRO, Q-Chem, and DALTON. Each of them can perform calculations using a large variety of methods and algorithms. Still, none of them can do everything that we possibly need, and every now and then one has to write their own code to solve a particular problem. Do I need to know how to program to be a quantum chemist? You do not need to be able to program initially. However, in the course of a graduate study in quantum chemistry you will surely learn how to read the code written in several programming languages and how to write a code in at least one of them. At the same time, you will gain a good working knowledge of the Linux/Unix operating system - this is the system which all our big computers are running. What computers are available for your group? We have our own cluster with a small number of powerful nodes (with four 12-core AMD Opteron CPUs, 128 GB of memory, and 5 TB of disk space on each node) that will be extended and upgraded in the next years. 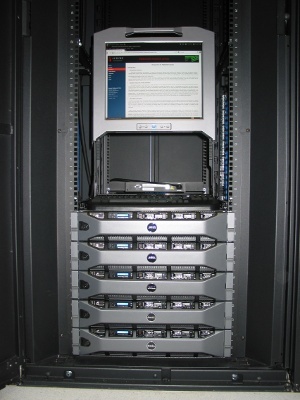 Our group can also run calculations using the machines in the Alabama Supercomputer Center, a supercomputing facility (located in Huntsville) shared by all educational institutions of Alabama. NIST Chemistry WebBook - if you need molecular reference data, this is the place. EMSL Basis Set Exchange - if you need basis sets... well, you know. The Wikimapia project - let's describe the whole world!